Does Germ Doc™ leave a strong disinfectant odor after use? NO! Germ Doc™ is completely ODORLESS. People will not even know you’re using it. Can I use Germ Doc™ around my pets? Yes. 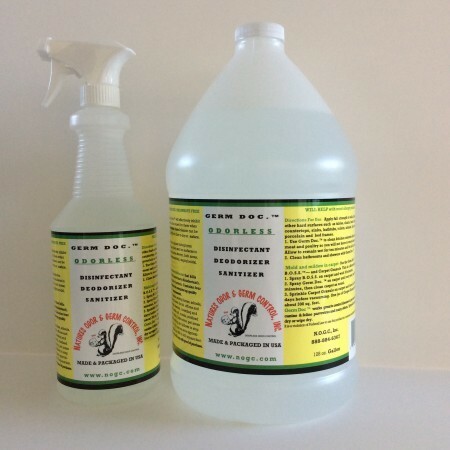 Germ Doc™ works great to control diseases such as canine parvovirus. Use Germ Doc™ in all your pet areas. Spray areas and let air dry or wipe dry. Pets can use the areas immediately after they are dry. Will Germ Doc™ kill mold, mildew, and black mold? Yes! Germ Doc™ is our E.P.A. registered Mildew stat that kills mold, mildew, and the odors caused by them. Use the B.O.S.S. By N.O.G.C. as your cleaner and Germ Doc as your spores and funguses killer. Does Germ Doc™ contain any chlorine bleaches or phenols? NO! 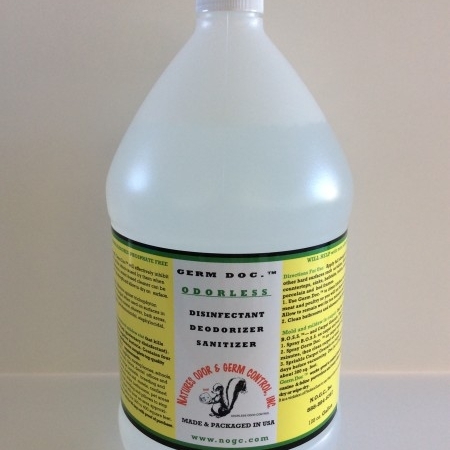 Germ Doc™ is phosphate free, no chlorine bleaches and no phenols. Safe for people, food, and pets. Can I use Germ Doc™ on the carpet and other fabrics? Yes! Germ Doc™ is known to be very effective in killing mold and mildew spores and fungi in carpeting and furniture. How is Germ Doc™ different from other disinfectants? Germ Doc™ is odorless. Also, most disinfectants on the market contain only one or two quats for their disinfecting power. Germ Doc™ contains four top-quality quats plus other ingredients for complete odor control and cleaning action. Extensive testing has made Germ Doc™ a leader as a top quality disinfectant. Germ Doc™ is a hospital grade disinfectant. Can I use it in my house? Yes. Germ Doc™ can be used in numerous places at home. Bathrooms, pet areas, kitchens, trash containers and more. Even lightly mist bedding and pillows to stop the spread of colds and flu. Is Germ Doc™ just for use on kitchen counters? No. Use Germ Doc. can be used any place you want to control the spread of germs. Dining tables, bathrooms, baby’s room, storage areas, upholstery, carpets and more. Is Germ Doc™ just for household use? Mildewcidal: Use full strength. Germ Doc™ will effectively inhibit the growth of mold, mildew and the odors caused by them when applied to surfaces. 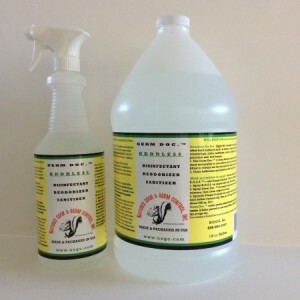 Use anywhere a water-based cleaner can be used. Always use Germ Doc™ full strength and allow to dry on the surface. Germ Doc.™ is our E.P.A. Registered mildew stat that kills mold and mildew, spores and fungi (quaternary disinfectant). Kills gram-positive and gram-negative bacteria. 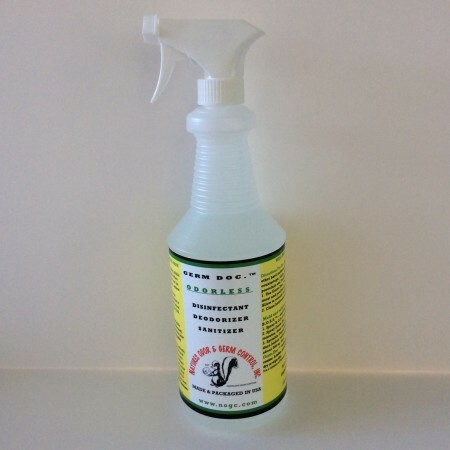 Contains four top-quality quats plus other ingredients for complete top quality disinfectant, which meets O. S. H. A. requirements. RECOMMENDED FOR USE IN: hospitals, nursing homes, schools, colleges, public restrooms, veterinary clinics, dental offices and labs, food processing plants, pet shops, kennels, breeding and grooming establishments, airports, hotels and motels, confined animal houses, households (kitchens, sinks, bathrooms, pet areas or just any where). Even lightly mist bedding and pillows to stop the spread of colds and flu. One quart will treat an area approxi­mately 75 to 100 square feet. One gallon for 300 to 400 square feet. RECOMMENDED FOR USE IN: hospitals, nursing homes, schools, colleges, public restrooms, veterinary clinics, dental offices and labs, food processing plants, pet shops, kennels, breeding and grooming establishments, airports, hotels and motels, confined animal houses, households (kitchens, sinks, bathrooms, pet areas or just any where). Even lightly mist bedding and pillows to stop the spread of colds and flu. One quart will treat an area approxi­mately 75 to 100 square feet. One gallon for 300 to 400 square feet. Apply full strength to walls, floors and other hard surfaces such as tables, chairs, lawn furniture, countertops, sinks, toilets, urinals, tiles, hampers, porcelain and bed frames. 1. Use Germ Doc.™ to clean kitchen counters after cutting up meat and poultry so you will not have to worry about ecoli. Allow to remain wet for ten minutes and let air dry or wipe dry. 2. Clean bathrooms and showers with Germ Doc.™. 1. Spray B.O.S.S. on the carpet and wait 30 minutes. 2. Spray Germ Doc. ™ on the carpet until very wet; wait 45 minutes, then clean carpet as usual. 3. Sprinkle Carpet Granule on the carpet and leave for four to five days before vacuuming. One jar of Carpet Granule will treat about 300 sq. feet. Germ Doc ™ works great to control diseases in pet areas such as canine & feline parvovirus and many others. Spray all areas and let air dry or wipe dry.